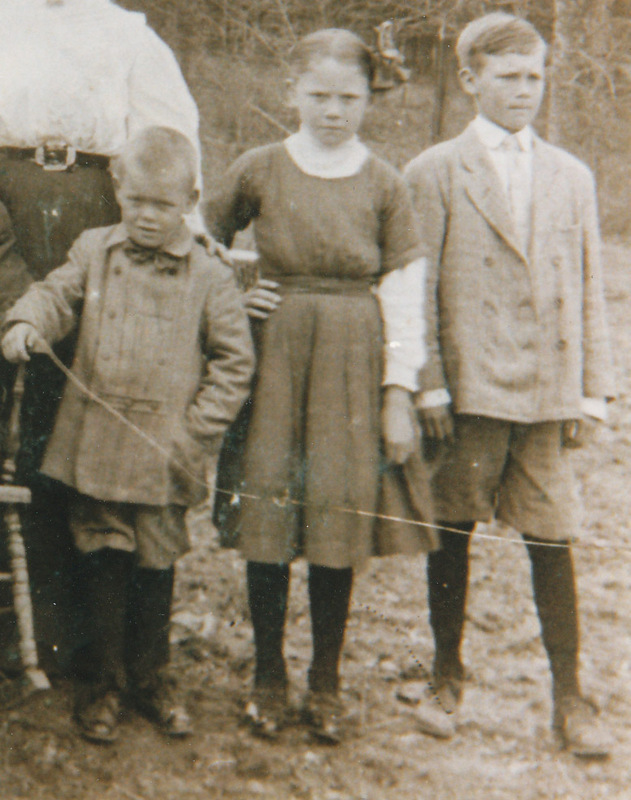 Edith Foley, the oldest of six children and the only daughter of John and Daisy Foley, had her teaching certificate from Blue Mountain College. At the age of 20 she left her parents and five brothers and went to teach at a one room school, grades from first through eighth, in Northern Mississippi. She boarded with a lady in the community whom everyone called “Old Aunt Susie.” Edith loved teaching the twenty or more pupils at the school. The parents were happy to have her and gave her support. Some would come early in the winter months to build a fire in the pot-belly stove, so the room would be warm before the teacher and students arrived. The fire wood was furnished by the families who had children attending the school. The older boys of the families clamored to be the one to drive the team of horses and wagon with the load of wood to the school in order to get a look at the new, pretty, single school teacher. Edith was very fond of her students but two were especially nice and well mannered. Their names were Rainey and Wardie Cossitt. She was sometimes invited to partake of a meal at their home and discovered that they had four older brothers, Leslie, Oscar, Ernest and Hubert. Most of the social life in this small community centered on the Church and parties held in individual home. One Saturday night a social was to be at Aunt Susie’s home. Now Aunt Susie had a large home and could accommodate the whole neighborhood. After much singing and dancing Aunt Susie was worn out and excused herself to her bedroom. But the party continued and the young people started the game of Blind Man’s Bluff. This is where a guy is blindfolded and tries to catch a girl. He then will get to dance with her or have refreshments with her. Unbeknown to the school teacher Hubert Cossitt had made arrangements to be blindfolded and have one of his brothers get behind the school teacher and make a noise so he could catch the teacher. The game went on with Hubert blindfolded and with out-stretched waving hands and listening to his brother’s voice and the crowd egging him on trying to catch the pretty school teacher. The next sound was the school teacher crying out in pain. Hubert quickly jerked the blindfold off and went into Aunt Susie’s bedroom. Aunt Susie raised up in her bed and said “Hubie what is wrong?” Hubert Cossitt replied “I stuck my finger in that damn old school teacher’s eye.” The party was over! On Monday Wardie Cossitt brought a note from her brother, Hubert, to give to the teacher. It was a letter of apology from her brother saying how sorry he was that he had stuck his finger in the teacher’s eye. At the end of the class that day as the students had left, a driver with a load of wood arrived at the school. In comes Hubert and makes his apology in person. That early romance led to the marriage of Hubert Pearl Cossitt (the 4th great grandson of Ruth and Rene Cossitt) and Lillian Edith Foley on May 20, 1925 in Ripley, Tippah County, Mississippi. Years later, when the story was told to Hubert and Edith’s seven children their father was always careful to tell them be careful and keep your eyes open. Special thanks to Cousin Johnnie Cossitt-Wood for this story about her parents.